Casla Home Care was set up by local entrepreneur Pádraig Ó Céidigh. A new home care company, which prides itself on its kind and caring staff, was set up to meet the growing need to help people live independently at home. 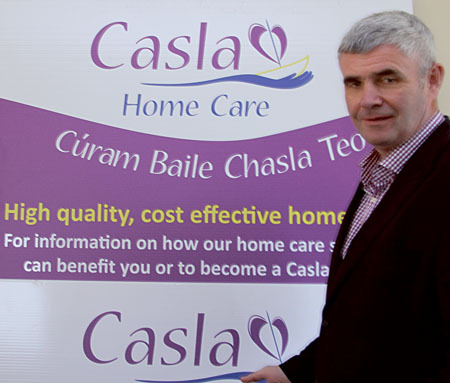 Casla Home Care was set up by local entrepreneur Pádraig Ó Céidigh earlier this year to provide support to older people, those with disabilities and anyone who needs help with personal care, household chores and socialising - any tasks necessary to maintain an independent life. The company, which is based in Inverin, is currently seeking experienced staff throughout Co Galway but especially in the city. Mr Ó Céidigh, the owner of the company Aer Arann Islands, says that there is a growing need to support people to live in their own homes. “As our older population increases, and because most people prefer to stay at home rather than opt for residential care, it is hugely important to the ongoing health and welfare of people that they get to stay at home for as long as possible. With Casla Home Care’s services people can continue to live at home with support from experienced carers backed up by management supervision. This week is Positive Ageing Week and we know that one of the most positive things for anyone in their older years is to support them to maintain their own independent life for as long as possible. Our services can do just that. He says he set up Casla Home Care because he knew it could provide a top quality home care service, based on Irish experiences and expertise, and with reference to best practice from the UK and other countries. “Casla Home Care is not a franchise but an indigenous Irish company with the highest standards of service, and policies and procedures based on HSE and Department of Health guidelines and best practice. Our home care support workers undergo a rigorous recruitment and checking process and are selected for their genuine kindness and approach to caring. “Our approach to care is to treat each person as an individual, developing a care plan based on their particular needs and lifestyle. In the Connemara area, where the company started and is based, we believe it is absolutely vital to provide home care services to people in their native language. Where possible we match Irish speaking carers with Irish speaking service users, to ensure they are fully comfortable with the support they receive.